Let’s now take a tour to the beautiful valley of Srinagar through some of the mouthwatering dishes. Who said that the Kashmiri cuisine is only for the non-vegetarians? They might have not tasted these yummylicious vegetarian dishes. Dum aloo, tahar, chaaman, haakh are integral to the vegetarian Kashmiri cuisine. 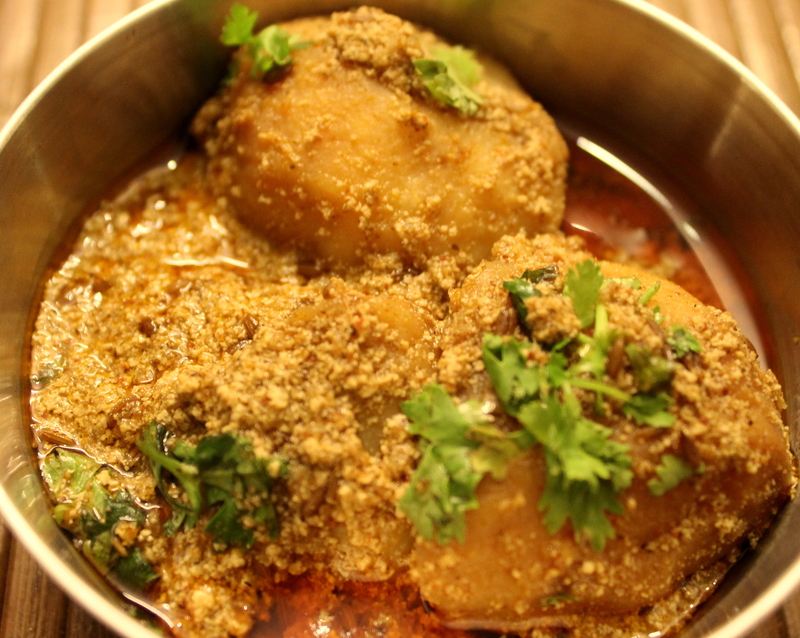 Dum Aloo: The Kashmiri dum aloo is one of the most famous dishes for the vegetarians, from the Kashmiri cuisine. The large-sized potatoes are boiled in a spicy red gravy, which not only imparts taste but also a hue of red to the potatoes. Stuffed with a rich filling of khoya and cashew nut, the spicy dum aloo are the most widely preferred North Indian dish. The next popular Kashmiri Vegetarian dish is Tahar, also known as the Kashmiri yellow rice. Tahar or Yellow Rice: Generally prepared by the Kashmiri pundits as a Prasad, this is a perfect lunch box meal. Tahar is among the popular vegetarian dishes of the Kasmiri cuisine. Made usually on special occasions, Tahar, is turmeric rice that tastes amazingly good with dum aloo. Ledar Chaman or Yellow Paneer: Paneer is an important element of the vegetarian saal. Cooked until the paneer looks creamy, yellow and soft .The dish is prepared during festivals and special occasion is usually relished with Tahar or yellow rice. The paneer in this dish is made from the scratch, then it is fried and mixed with turmeric gravy. Served hot, this dish is sure to awaken the foodie in you. Haakh: The most elemental of all vegetables, the Kashmiri Haakh, also known as Saag, is a lip smacking dish from the heavenly Kashmiri cuisine. 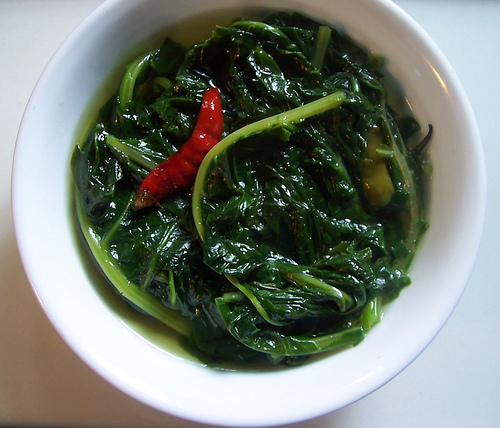 A staple Kashmiri dish prepared with green collard, is known for its bitter, sharp taste and is served as a side dish. Meat eating is a popular Kashmiri tradition one of the main reasons why Kashmiri cuisine is dominated by the non-vegetarian food. It is believed that the way to one’s heart is through the stomach but, the Kashmiri Wazwan is a straight road to paradise. A royal multi course meal, its preparation involves overnight cooking of the meat,in this Waz – is the chef who is blessed with amazing culinary skills and Wan is a shop with abundant meat supply. Once the meal is cooked and completed it is served in special plates called trami. Wazwan consists of mainly non vegetarian Kashmiri dishes like Rogan Josh, Goshtaba, Yakhni and many more. 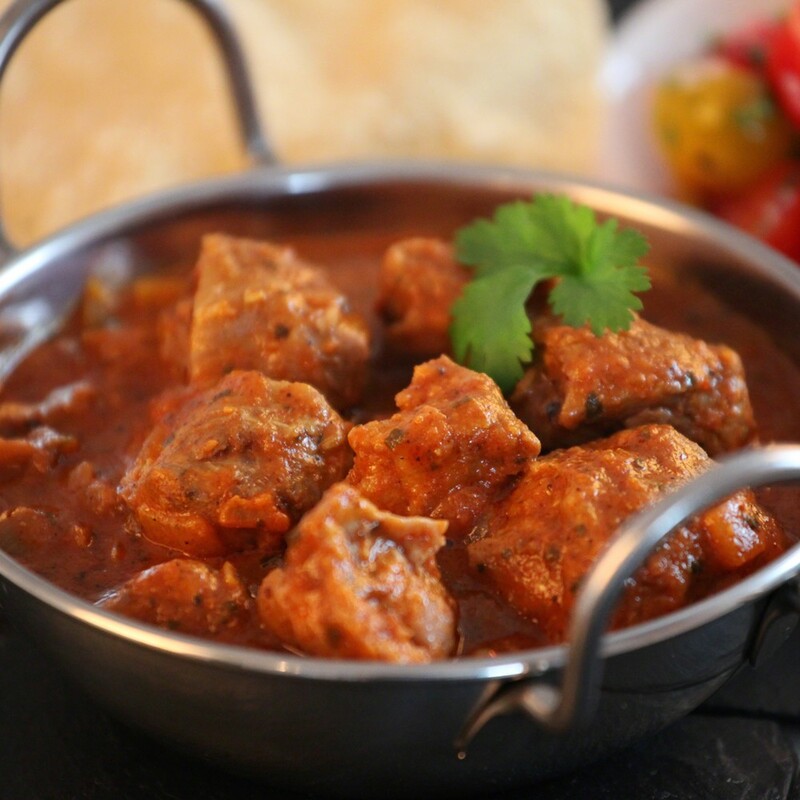 Rogan Josh: One of the signature dishes of the Kashmiri cuisine, it is prepared as a part of the grand Wazwan. This aromatic lamb dish of Persian origin literally means red meat cooked in heat. The dish is eaten by both Kashmiri muslims and the pandits, but the pandits make it extremely spicy. Goshtaba: Prepared as a part of the royal multi course meal, this dish is served just before the desserts. 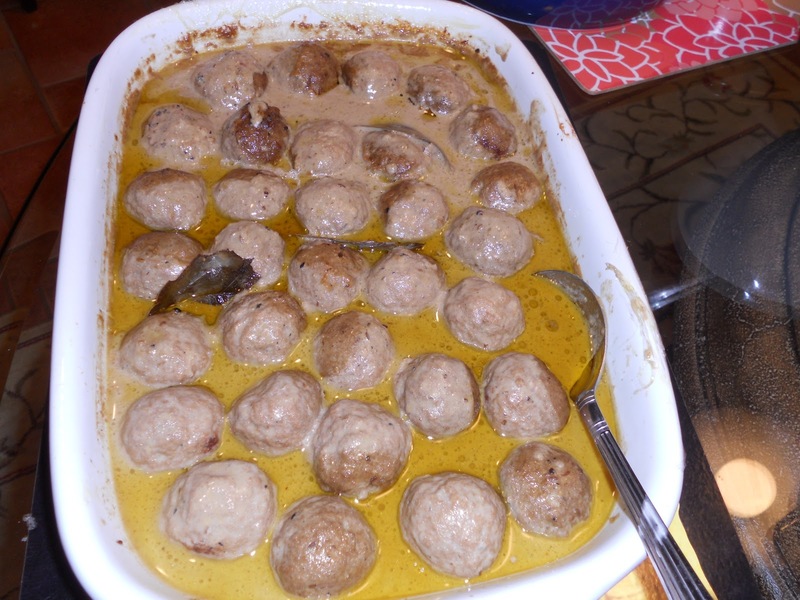 It is made in yogurt with minced mutton balls and takes at least 60 minutes to cook it. Garnished with coriander leaves this dish is as tasty as it looks. 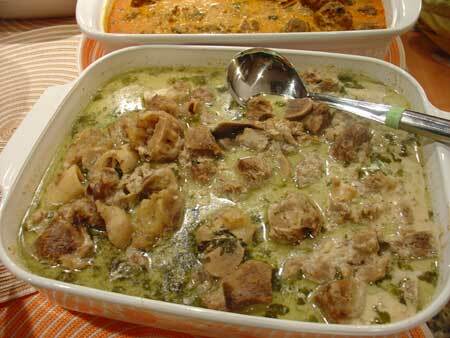 Yakhni: A dish made from juicy mutton pieces, is marinated and mixed with a rich gravy of curd. Mixed with turmeric, cinnamon, fennel, and salt, being the main ingredients, this dish is also a part of the royal multi course meal, Wazwan. Moving on to the breads of the Kashmiri cuisine, we bring to you Kashmiri Naan and Roth. Kashmiri Naan: A flat Indian bread, baked with nuts inside, this is a famous delicacy of the Kashmiri cuisine. Unlike the usual naan, this is a sweeter version and much tastier with ingredients like sugar, cashew nuts and almonds. 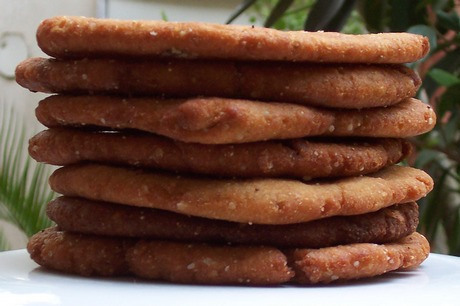 Roth: Made during the auspicious occasion of the Kashmiri New Year, Roth is a sweet tasting bread made of ghee, sugar and flour. Kulcha: Exclusive to the Kashmiri cuisine, this kulcha is a part of the breakfast menu. Made from a mixture of maida and wheat-flour, it is put in a traditional kiln till it is properly cooked. The result is a tasty brown colored bread which can be eaten with Sheer Chai. Beverage, literally meaning a drink other than water, completes any cuisine and in the Kashmiri cuisine, we would mainly be talking about the two main beverages: Sheer Chai and Kahwah. Sheer Chai: Noon Chai a.k.a. Sheer Chai, is a pretty pink colored beverage made from special tea leaves. This chai is not known as noon chai because it has anything to do with the noon but noon in Kashmiri language is known as salt. 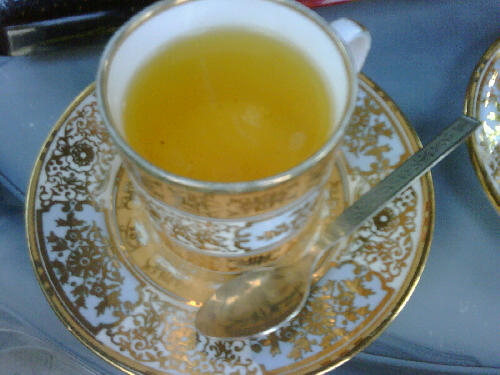 Kahwah: The Kashmiri green tea or kahwah is the most famous tea of Kashmir. 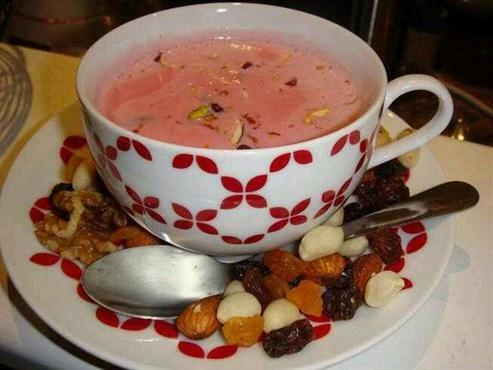 Mostly known to all, this beverage is consumed in breakfast by the Kashmiri’s and is made to be more aromatic by adding roses to it. 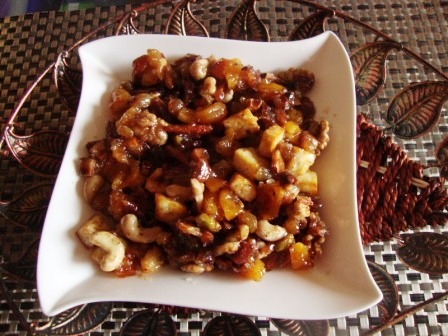 Kashmiri Shufta is a famous dessert from the Kashmiri cuisine and is made with rich with dry fruits and spices coated with a sugar syrup. Ending it on a sweet note, Baqar Khani is another desert which you could try, when in Srinagar book your stay with RK Sarovar Portico as it offers some of the best facilities and serves delicious Kashmiri food.